• The Youngstown State men's basketball team opens its 87th season when it hosts Mid-American Conference member Akron, Saturday, Nov. 12, at the Beeghly Center. • Tipoff is slated for 7:45 p.m. ET and is on 570 AM WKBN, ESPN3 and the WatchESPN app. 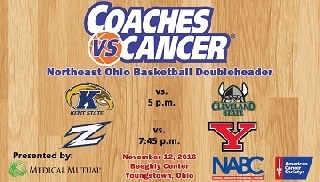 • The game is part of the 2nd Annual Northeast Ohio Coaches vs. Cancer Basketball Doubleheader. • Kent State and Cleveland State play 5 p.m. at Beeghly Center. • Akron will host the event in 2017 and Cleveland State in 2018. • The Penguins play their first road game of the season against another Mid-American Conference foe Toledo, Tuesday, Nov. 15. • Tipoff is slated for 7 p.m. and the game will on 570 AM WKBN. • Junior Cameron Morse scored a team-high 24 points and made six 3-pointers to lead the Youngstown State men's basketball team to a 100-61 exhibition win over Penn State-Behrend on Saturday afternoon at the Beeghly Center. • Morse connected on 8-of-10 shooting from the field, including 6-of-8 from behind the arc, and grabbed four rebounds. • Senior Matt Donlan also reached double figures with 11 points and three 3-pointers while sophomore Devin Haygood scored nine points with a team-high seven rebounds. • Junior Rahim Williams also poured in nine points and senior Brett Frantz added eight points. • The Penguins hit a total of 17 3-pointers and eight different players made at least one from distance. • For the game, the Penguins connected on 50.7 percent from the field and 48.6 percent from 3-point range. • Head Coach Jerry Slocum has 710 career wins and became the 38th head coach in NCAA history to reach 700 wins. • He ranks 37th with 710 career wins. • Slocum currently ranks eighth among active NCAA Division I coaches with 710 wins. • Akron enters the 2016-17 season as the preseason favorite to win the Mid-American East Division and the MAC Tournament. • The Zips return nine letterwinners and three starters from last year's 26-9 team. • Senior Isaiah Johnson, who averaged 13.6 points and 7.6 rebounds per game last year, was a Preseason All-MAC First-Team pick. • This is the 89th meeting between Youngstown State and Akron in a series that dates back to 1937. • The Zips own a 57-31 advantage in the all-time series and have won the last six meetings. • The last Youngstown State win came in 1994 - a 69-53 victory at the Beeghly Center. • Give Youngstown State its 32nd win over Akron. • Mark YSU's first win over the Zips since 1994. • Mark YSU's 23rd win over Akron at the Beeghly Center. • Mark YSU's 41st season-opening win. • Mark Jerry Slocum's 711th career win and his 130th at Youngstown State. • Mark Jerry Slocum's first win over Akron. • Mark the 1,064th victory in program history. • Give the Penguins an 1-0 overall record. • The Penguins own a 40-46 mark in season openers. • The Penguins' last season-opening win at home was a 64-61 victory over Samford on Nov. 12, 2010. • Junior Cameron Morse has scored 710 points in just two seasons and needs 290 more to become the 37th player in school history to reach 1,000 career points.